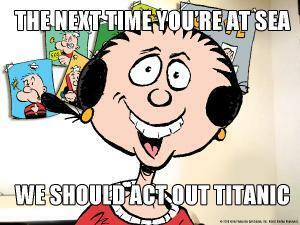 » Popeye’s Main Goil, Olive Oyl, as “Overly Attached Girlfriend”! 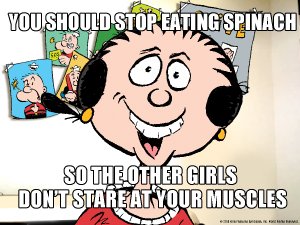 Popeye > News > Uncategorized > Popeye’s Main Goil, Olive Oyl, as “Overly Attached Girlfriend”! Thanks to the enthusiastic response from fans on Facebook who loved when Popeye channeled Dos Equis’ “Most Interesting Man in the World,” today we have continued the tradition of drawing our favorite characters into popular Internet memes. 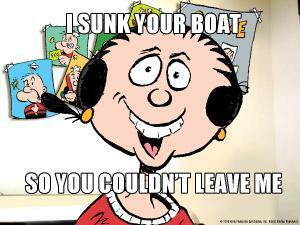 We can’t wait to hear what meme Popeye’s loyal fans want to see our famous sailor and his crew as next! Put your ideas in the comments after you check out some more Olive Oyl as “Overly Attached Girlfriend” scenes below! 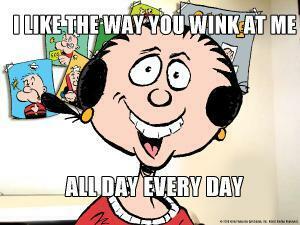 And don’t forget to follow Popeye on Facebook and Twitter so you don’t miss any of the fun.